The beam angle is adjustable up to 120 degrees to highlight artwork or graze walls. LED lamps have a much longer life than incandescent lamps. They do not emit UV rays. They put out very little infrared or heat. They are ideal to light artwork or photography that is sensitive to UV or temperature. 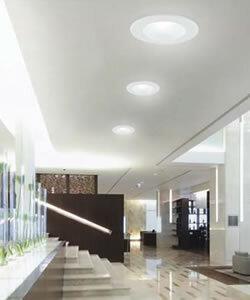 LEDs are highly energy efficient offering significant savings on electricity bills. Their longer lifespan reduces maintenance time and costs, making them ideal for hard-to-reach places. 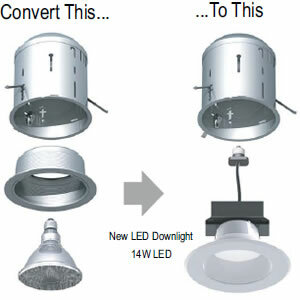 Eurofase 25081 6″ LED Conversion Kit 6″ 14 watt LED Conversion Kit converts a typical existing recessed fixture into a new 14 watt LED downlight. This entry was posted on November 8, 2012, in Lighting, Recessed Lighting and tagged ambient lighting, artwork, can, decorating, downlight, energy efficient, Eurofase, general lighting, interior design, LED, light, lighting, paintings, picture light, recessed, Recessed Conversion Kit, recessed lighting, UV. Bookmark the permalink.